When I first learned about the solar system a few decades ago, the scientific consensus held that the structure of our solar system resulted from standard processes of stellar evolution. The arrangement of planets with small rocky worlds closer to the star and gas and ice giants further out would be the normal arrangement of planetary systems. Then we began to find planets around other stars and we learned that our solar system is – if not an oddity – by no means typical. With just one example, it is easy to be led astray. In our solar system, there are only two large rocky worlds, Venus and Earth. Mercury and Mars are small enough that both lost most of their internal heat billions of years ago and they have largely ceased to further evolve. (The ancient, preserved, surface of Mars is what makes it so attractive to explore for the types of habitable environments that were long ago erased from the Earth’s surface.) Both Venus and the Earth, however, retain substantial heat in their cores. That heat drives plate tectonics on our world and appears to have caused the near global resurfacing of Venus in the last few hundred millions of years (which counts for recent when compared to the age of the solar system). While Venus and Earth have similar sizes and are solar system neighbors, they have evolved very differently. Venus today lacks oceans, appears to lack plate tectonics, and has a massive carbon dioxide atmosphere that creates a greenhouse effect that makes the surface a hot hell. Understanding why Venus and Earth became so different will help us understand why Earth evolved as it has and what the range of conditions for similarly sized worlds around other stars may be. Venus provides the contrast to the Earth that can help us both better understand the origins of our world’s characteristics and the range of possibilities for similar sized planets orbiting other stars. Today, our knowledge of Venus’ surface and its interior is similar to our knowledge of Mars in the 1970s following the Viking mission. The Soviet Union placed several probes on the surface that made simple measurements in the hour or so before the surface heat fried their electronics. NASA’s Magellan spacecraft mapped the surface with radar in the early 1990s at about 120 m resolution globally. We know, however, from our experiences mapping the Moon and Mars’ surfaces that teasing out the details of geologic processes requires mapping surfaces with resolutions less than 50 m resolution with smaller areas mapped at a few meters resolution. Mapping Venus’ surface (with one exception we’ll return to later) requires using imaging radars that can penetrate its thick cloud cover. The technology in the early 1990s when Magellan flew was relatively new and crude by today’s standards. Now imaging radars are widely used to study the earth both from airplanes and from satellites. The technology is mature and relatively low cost. As a result, something of a cottage industry has grown up proposing new missions to map Venus either through the European Space Agency’s Medium Class program or through NASA’s Discovery program. The different accounting rules applied by the two agencies make direct cost comparisons difficult, but these missions cost in the neighborhood of $500M to $600M. A Venus radar mapping mission has been proposed for the current ESA Medium Class competition, and I hear that up to three missions are in competition for selection through the NASA program. The average age of Venus’ surface is just a few hundred million years old, a tiny fraction of the age of the surfaces of most rocky and icy moons in the solar system. What processes resurfaced the planet? Did they occur in the same time period or have they been spread over time? Is Venus currently geologically active and therefore continuing to remake its surface and release new gases into the atmosphere? What processes modify rocks once they are delivered to the surface? Venus’ atmosphere is so thick that its surface in many ways is similar in terms of pressure to what is found at the bottom of our oceans. This should lead to complex weathering and erosion, which is consistent with what we saw from the pictures taken on the surface by the Soviet Union’s Venera landers. What is the internal structure of Venus like? This is the part of a planet we can never see, but scientists can study it indirectly through the combination of Venus’s gravity field and surface topography. Both were mapped by Magellan, but at too crude of resolutions to answer key questions. To address these questions, the EnVision spacecraft would carry four instruments. 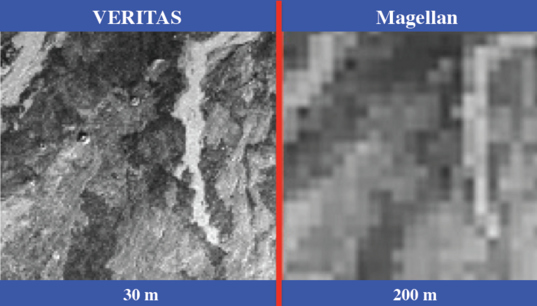 These images, derived from radar imaging of Hawaii, show the improvement in resolution possible with modern radar systems compared to the data returned by the Magellan mission. This image is from a poster describing a 2012 JPL VERITAS mission that was proposed for the NASA Discovery program. The EnVision spacecraft’s primary instrument would be its VenSAR synthetic aperture radar. Operating in its primary mode, VenSAR would map almost the entire planet in stereo at a resolution of 27 m. The radar would produce both images (the equivalent of images from a camera) as well as high resolution measurements of the absolute elevation of the surface to map its topography. VenSAR would have a number of special modes that would enable other forms of mapping. Small splotches of the surface would be mapped with resolutions as fine as 1 to 2 meters, which would allow, for example, the instrument to spot the Venera landers on the surface. 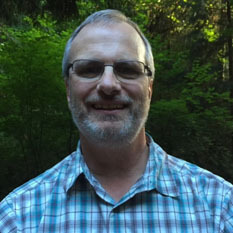 An interferometric mode would enable EnVision to spot tiny changes in relative elevation in a location that could indicate movement from a seismic event or the swelling of a volcano. By using different polarizations of the radar beam, the spacecraft will be able to map differences in texture across the surface to distinguish, say, a plain covered with rocks too small to image directly versus a plain covered in sandy material. 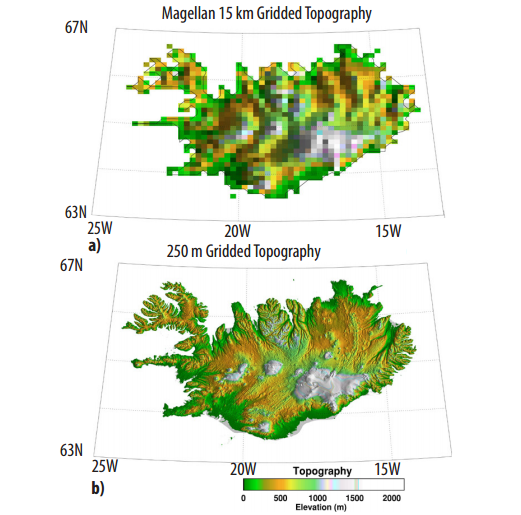 These figures show the improvement in topographic resolution possible with a modern radar instrument using data from Iceland. The top image shows the equivalent Magellan resolution and the bottom image shows simulated resolution possible from a new Venus radar mission. Example of the ability to detect geologic changes in vertical heights as small as a few centimeters. This example is from an Earth-orbiting radar mission for changes following a terrestrial earthquake in 1992. Expected mapping coverage of Venus by the VenSAR instrument for the proposed prime and possible extended missions. The Spotlight mode would be used for only selected areas such as the locations of the Venera landers. The VenSAR instrument cannot see below the very top of the surface of Venus. EnVision would carry a low frequency radar sounder whose beams would penetrate several hundred meters below the surface. 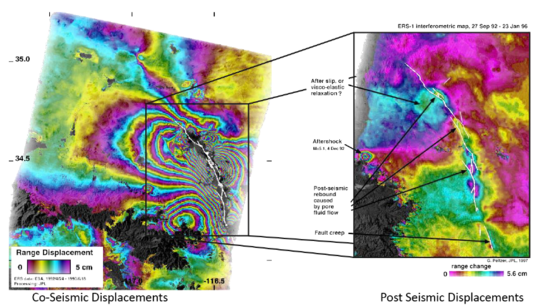 The result is a radargram that looks a bit like a sonogram or x-ray of the stratigraphy of the upper surface. Two similar instruments are at Mars now, where they have examined the distribution of soils and ice at that world. At Venus, this instrument would study the depths of lava flows and sedimentary rock layers and search for faults and folds that indicate past tectonic activity. Example of subsurface stratigraphy revealed by a low frequency radar sounder for the Martian northern polar cap. The third instrument, the Venus Emission Mapper (VEM) would study Venus in an entirely different way than the radar instruments. 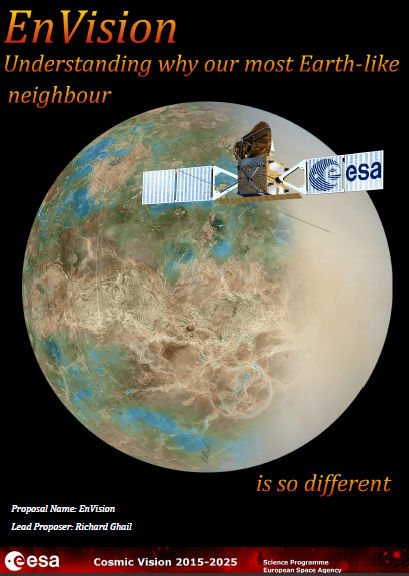 The Galileo and Venus Express spacecraft’s instruments discovered narrow spectral windows where thermal emissions can be transmitted through the otherwise opaque clouds. These few windows would give the VEM instrument the ability to map thermal hotspots that would indicate areas of current volcanic activity, map differences in the composition of the surface, and detect changes in key atmospheric gases that could indicate the eruption of a gas-spewing volcano. Because Venus’ thick atmosphere would scatter the light, the surface resolution of VEM would be low, around 50 km. It could make, however, ground breaking measurements of the surface variation. The recently completed Venus Express mission carried out some measurements using this technique, but its instrument wasn’t optimized for measurements using these spectral bands. The VEM instrument would provide much more sensitive measurements. The Venus Express mission carried out the first mapping of Venus’ surface using thermal emissions. 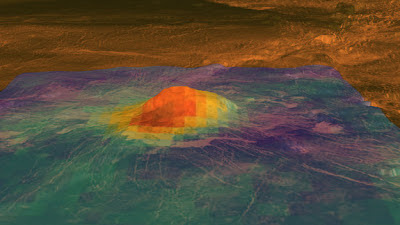 Red-orange colors in this Venus Express image of Venus’ Idunn Mons volcanic peak indicate warmer areas suggesting different surface compositions and younger ages than surrounding material. The EnVision radio system would be its fourth instrument. By tracking minute differences in radio frequency caused by the spacecraft speeding up or slowing down as the mass of the planet below it varies, the spacecraft can study variations structure deep below the surface. EnVision has been proposed for ESA’s fourth Medium-class scientific mission. The ESA competitions pit proposals from across space science against each other, so the EnVision proposal will be judged against both other solar system missions as well as those that would study astrophysics and the Earth’s magnetosphere. The next key milestone will come in the next month or two when ESA’s managers select several finalists for more detailed analysis. If the EnVision mission is the final selection, it would launch in December 2024 and would arrive at Venus a few months later. The prime science mission would take approximately two and a half years, although the team hopes that the mission would be extended for a second 18 month observing campaign. When I read about proposals for most small-scale planetary missions (ESA’s Medium class, NASA’s Discovery class) their goals are often narrowly focused so that they can be met within a constrained budget. In the last Discovery mission selection, several Venus mapping missions were proposed. I’ve heard that each focused its science questions in different somewhat narrow ways that lead review panels to be confused about what the actual priority would be. For me, the true value of a mission like EnVision is the breadth of its data. Scientists could mine the data from a mission like this for many years and use the data to develop and then answer questions that we don’t yet know enough to ask. Sending another imaging radar equipment to re-map Venus' surface will settle once and for all whether there are new volcanic fields on Venus since Magellan last mapped her 20 odd years ago. Discovery of new lava fields can also help indicate whether the cyclical sulphur dioxide abundance in the Venusian atmosphere has any bearing with new volcanic eruptions or upper/lower atmospheric circulation instead. Any positive confirmation will be ground breaking, proving Venus is still geologically active and add it along Io as being another volcanically active body in our Solar System. It would be a real nice achievement for ESA, and the cost to achieve this is not as costly compared to a lot of other missions. From Van - Unfortunately, the EnVision mission will not move forward for the M4 competition. From the team’s Facebook page: “ESA announced this morning that EnVision has been evaluated as "incompatible with the technical and/or programmatic boundary conditions for the M4 Call". Essentially this means that ESA believe we would over-run on cost and/or schedule. We await further feedback which will inform our proposal to the M5 Call expected later this year.” While EnVision is out for this current M4 contest, reviewing its proposal can still let us see what type of missions are being proposed. The proposals to NASA’s current Discovery program will have differences from EnVision and the cost assumptions are different. Also, ESA is expected to begin the competition for its 5th Medium Class mission later this year and there may be a larger mission budget. The EnVision team hopes to propose this mission, perhaps with modifications, in the next competition. To get a mission selected for Venus requires playing the long game. Each competition that a team doesn’t win gives them feedback on how to improve their proposal. I agree that one important objective is to find more definitely if Venus has active volcanoes but if they are found I wouldn't welcome this. The reason is the SO2 contributes to the sulfuric acid clouds above Venus according to Dr. Grinspoon. I think some CO2 consuming bacteria should be released into Venus' atmosphere breathing out O2 which could lower the greenhouse effect and the surface temperature and limit the likelihood or further volcanic activity and reinforcing sulfuric acid clouds and perhaps making its surface more visible. Could then the hydrogen in the sulfuric acid combine with some of the O2 to make more water on a cooler Venus?